These two great football teams faced each other in the 1970 World Cup semis, their cars were world-beaters too but what one scor Published: 21st May 2018 - 0 Comments - Be the first, contribute now! Warwickshire-based One2one Motorsport is probably the UK’s leading 02 exponent. It says prices are soaring and despite not having the factory back catalogue backing like Mercedes, parts supply is – with the exception of chromework – good with most owners being ‘second time around’ ones. Buying a new car some half a century ago was a world away from today – and we don’t simply mean their prices. Back then, before PCP plans were even thought of, cars displayed screen prices and by-and-large that’s what they sold for as discounting really only came to prominence after the Energy Crisis and subsequent sales slump during the 1970s. Fast forward 50 years, and screen prices have been cunningly replaced with monthly payments meaning, within reason, anyone can afford (by juggling the figures and worrying over the final settlement later…) a shiny new 18 plate car, even a prestigious one like an Alfa Romeo and or a BMW. It wasn’t like this when the Alfa GTV and BMW’s 02 Series were in the showrooms. Thanks to import duties, before the UK joined the Common Market, you really had to be doing nicely thank you to afford a 2002 tii or the latest GTV 2000, willing to stump up at least £2500 for these status symbols, which was why our own Dolomite Sprint looked a brilliant bargain at just £1800 in 1973. It still is because while the Brit has slowly increased in value, its European rivals have soared – it’s deja vu all over again! The one thing the BMW 2002 and Alfa’s GTV had in common when new was class and, apart from rusting, little has changed. The 2002, (and its predecessor 1602) was for those who appreciated BMW build quality and engineering excellence long before the blue BMW badge evolved into a fashion statement. Likewise, the GTV was a real Alfa Romeo before rehashed Fiats came along. Although the 02 looks like a saloon, it – along with the 1602 – was initially marketed as a coupé by BMW even though it’s smart but far too boxy to be considered one. Subjective looks apart, there remains an air of modesty and functionality about the Bavarian. In contrast, the Alfa remains as one of the best looking coupés ever penned – indeed, has Alfa ever matched it since? No – we don’t think so either! In terms of choice, the BMW offers more models within the 2002 range, the twin carb but LHD only 2002ti and the fuel injected tii (the Golf GTi of its day), which is the one that excites the most. Other models include the lesser 85bhp 1600cc 1602 range and the 1502; this is a 75bhp entry economy model that was launched to clear out the range before the first generation 3 Series surfaced. No four-doors were made in any variant but there are cabriolets as well as the excellent sportshatch 2002 Touring but this Scimitar GTE rival is only available in regular but reliable 100bhp carb tune. The great thing about Italian is that all engines, from the 1300 right up to the 2-litre, sport twin overhead camshaft engines fed by twin choke carbs and marshalled with five-speed transmissions – the only difference is their power. The 122bhp 1750 is regarded as the sweetest of the lot with the 2-litre the quickest, care of an additional 10bhp. And because the engines are so similar there’s a good chance lower-ranked GTVs have been promoted. That’s no bad thing in itself but it’s important that the brakes are uprated properly to suit (1300s used a different set up, for example). There was a convertible (GTC) but these are as rare as they are expensive. If the budget doesn’t run to a GTV (you’re looking at 15 grand minimum for a half decent example) the cheapest way to gain GTV-style motoring is to go for the Giulia saloon which mechanically is essentially the same bolide but a lot roomier and more practical with some rare estates too – shame about those boxy yet strangely quite aerodynamic looks, don’t you think? By this we don’t mean that the German is boring, because it isn’t… it’s just that the Alfa and the BMW offer sports car thrills in totally opposite ways. Not unexpectedly, it’s the Italian that’s all heart and soul meaning the driver invariably wears his or her blood pumper on their sleeve too. The engines are all sweet sounding gems that like to rev and the five-speed transmissions are geared for acceleration rather than lazy touring. All of which means that the GTV – be it 1300 or 2000cc – begs to be driven hard even if they sound faster than they actually are against the clock. In contrast, the BMW units are more subdued; strong and flexible but lively enough when called upon. The tii is the exception thanks to a racier camshaft and fuel injection raising the 2-litre’s game by 30bhp to 130bhp. Not only does it provide strong performance but it’s blessed with the sharpness that only the first 1600cc VW Golf GTi can compete with. 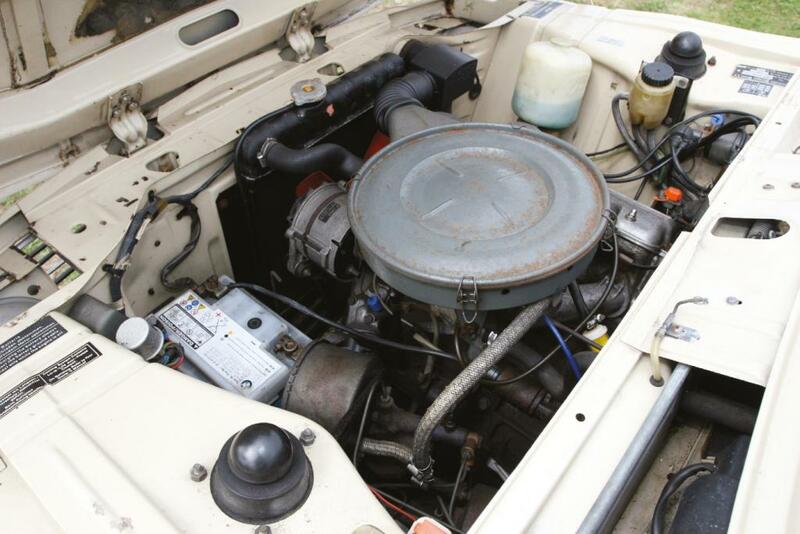 The 1573cc engine is especially smooth but much more sedate although the twin carb 2002ti with its 120bhp is zippy and much cheaper than an injected tii both to buy and maintain if you don’t mind LHD as they were never sold in the UK. Five speeds were optional on the tii, the rest employ a slick four-speeder that in true 1970’s German fashion leaves the BMW slightly undergeared plus road tests criticised the wide spaced 2nd-3rd ratio gap but, unlike the Alfa Romeo, there’s a automatic option if that floats your boat. The Alfa’s gearchange was described as “buttery” which is a good an observation as you’ll get while the close-stacked ratios means there’s a gear for every situation; good job, for to keep the 1.6 and the 1750 (regarded as the best of lot) on the boil you need to work the cogs. It’s in the handling department where the two cars differ the most. The GTV was considered something else in its day, loved for its flair and responsiveness. The BMW, thanks to a rear suspension design that – on the quicker 2002ti and tii in particular – is all too easy to upset and not unknown for tail slides, especially in the wet. Throw in a slightly frumpy-feeling steering and if you are more used to a modern 3 Series, this bygone Bavarian may unnerve as well disappoint you a bit. Compared to a modern 3 Series, or Giulietta, the pair feel a bit heavy and ponderous, especially their tillers, with low grip levels while, the Italian’s Porsche-like floor hinged pedals require – like the general driving position – some getting used to. First the prices as all have fairly rocketed of late. A decent 2002 tii is probably worth 15-20 grand, concours £30K with lesser 2002s perhaps half to two-thirds of these figures; the best bargains are the versatile Tourings which you can pick up a great one for only ten grand for no apparent reason. Turbos can make ten times this! GTVs start from £3000 for a basket case, £15,000 upwards for fair ones and around £40,000 for a concours 1750/2000 with the ultra rare GTA selling for Aston prices. GTV values slightly exceed those of the superb Spider convertibles but the frumpy saloons can be obtained with ease for under £10,000. What price vanity? Well supported by their respective specialists, but none are as easy to keep as an MG or Triumph and, as befitting their badges, parts are inherently costlier. Panel supply for the GTV is pretty reasonable and we hear that Cortina Mk3 boot floors make a good substitute! The engines are bullet-proof and well known (plus, you can even fit a later, near identical Twin Spark if you wish), it’s the brakes and of course Italian electrics that can be bugbears during ownership although pretty easily sorted. Rust and poor repairs are normally no worse than many other classics of a similar vintage, but check if that restoration is more than skin deep as even GTV roofs rot. If you’re buying a 1300 upgraded to a larger engine, see that the brakes (all other GTVs featured twin servos) are altered to suit. A Harvey Bailey suspension kit works wonders on all models. Despite their Teutonic build these old Germans can rot for England. Replacement panels are pretty readily available but all structural areas are suspect. Good old rear-wheel drive fun comes at a price – but look what Escorts are fetching! Overall, the Alfa shades it as a driver’s car as all GTVs enjoy the same character and brio (if not power) whereas the BMW, if truth be told, only shines in faster 2002 guises. What you get with the BMW, however, is impressive engineering and solid build, on a level you don’t find in a modern Beemer. In the thrilling 1970 World Cup semi final, Italy beat West Germany 4-3 and that’s this result in 2018.